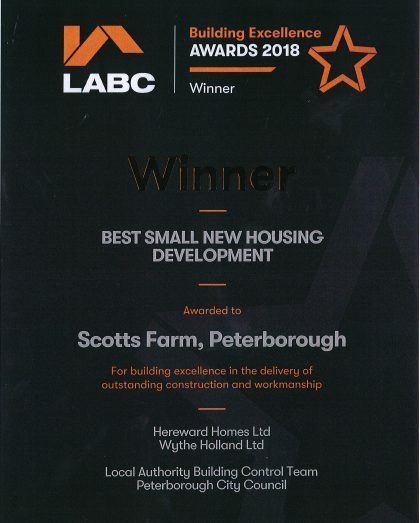 Hereward Homes is proud to have won the prestigious ‘Best Small New Housing Development’ title at the regional LABC Awards for their Scott’s Farm development in Glinton. The development beat off competition from other high-profile projects from across the Eastern region. 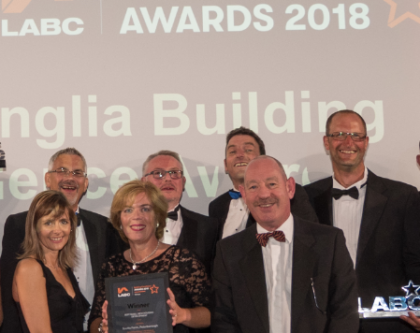 LABC East Anglia Building Excellence Awards took place on Friday 29th June at a glittering ceremony at King’s College, Cambridge. Following the win, the development has also been put forward for the LABC National Building Excellence finals which are being held in London on Friday 9th November 2018. In 2017, Rutland-based developer Hereward Homes completed work on Scott’s Farm development, a flagship scheme for the company which comprises five 4 and 5 bedroom high specification homes set around a private cul-de-sac. Glinton is a sought-after village where demand for quality housing is high, mainly due to a lack of development opportunities because of the extensive conservation area and surrounding areas green belt land. Scott’s Farm was a derelict farm yard. The victim of an arson attack, it had been an eyesore in the village for many years. As a detached village separated from Peterborough’s urban development, Glinton is a close-knit community with several fine examples of attractive cottages and imposing houses built from Barnack ragstone in the older conservation parts. Scott’s Farm required a design to blend into its predominantly traditional, rural surroundings. The project started in late 2011 when Hereward Homes entered a commercial relationship with the landowner. A previous developer had been refused consent for 8 homes on the land – a proposal which was considered far too dense. The landowner chose to partner with Hereward Homes as they used their experience to draw up sensitive plans which decreased the density, but increased the quality of the development. The development required determination, high levels of expertise and strong working relationships with third parties such as LABC, planners, conservation officers and environmental experts. The site’s prominent position within the village meant that only an outstanding development would be acceptable to residents and planners. The project required an established and passionate developer and has required high levels of expertise and sufficient long-term investment to bring it to fruition. The project took over 6 years, from the initial talks with the landowner, gaining more suitable Planning Permission for the development through to completion. During this time, there have been challenges which could have stalled the project along the way, but Hereward Homes MD, Jon Gibbison, remained optimistic that Hereward Homes would deliver a quality residential scheme within the village. The result is a development of 5 high quality homes which have a traditional appearance on the outside, but offer homeowners an energy efficient and contemporary specification on the inside. Please click here to read more information and see the development photos.